Mix “fiery-tempered Spaniards” and ignoble Virginians, and you’re likely to get trouble. Throw in Napoleon, and the plot thickens. . . . Amateur historian Carlson (Cattle, 2001, etc.) wonders why Thomas Jefferson should have bothered to send Meriwether Lewis and William Clark off on an arduous transcontinental journey by foot when Yankee clippers were already plying the Pacific coast, why he didn’t bother to commission one of those ships to pick them up at the mouth of the Columbia River. The answer? Jefferson didn’t want them to survive, didn’t think they would survive; he meant them as bait by which to pick a fight with the Spanish, who would certainly “try to stop them, perhaps even kill them” as they slogged their way across territory claimed by the Spanish crown. Such resistance would afford Jefferson a quasi-legal pretext for inaugurating a great land grab and forcing the Spanish empire south of the Rio Grande, as in fact happened 40 years later with the Mexican-American War. It makes a nice conspiracy theory, and it has a little merit: plenty of Jefferson’s correspondence (which, to judge by the scant bibliography here, Carlson has not consulted) suggests his dislike for Spain and his desire to make the land beyond the Appalachians part of the US. But Jefferson also plainly wrote that the Spanish empire in America would soon fall apart of its own accord without American soldiers having to do anything about it, and he counseled a wait-and-see approach at odds with the one Carlson proposes. 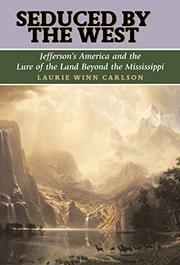 Carlson does a good job of restoring overlooked figures, such as mariner John Ledyard and accidental diplomat Nicholas Trist to the record, but her speculations pale next to far better-developed, and better-documented, recent studies of the Lewis and Clark expedition and westward expansion, notably Jon Kukla’s A Wilderness So Immense (p. 209) and Thomas Slaughter’s Exploring Lewis and Clark (2002). Flickers of interest, but an inconsequential entry in the crowded race of works devoted to the upcoming Lewis and Clark bicentenary.